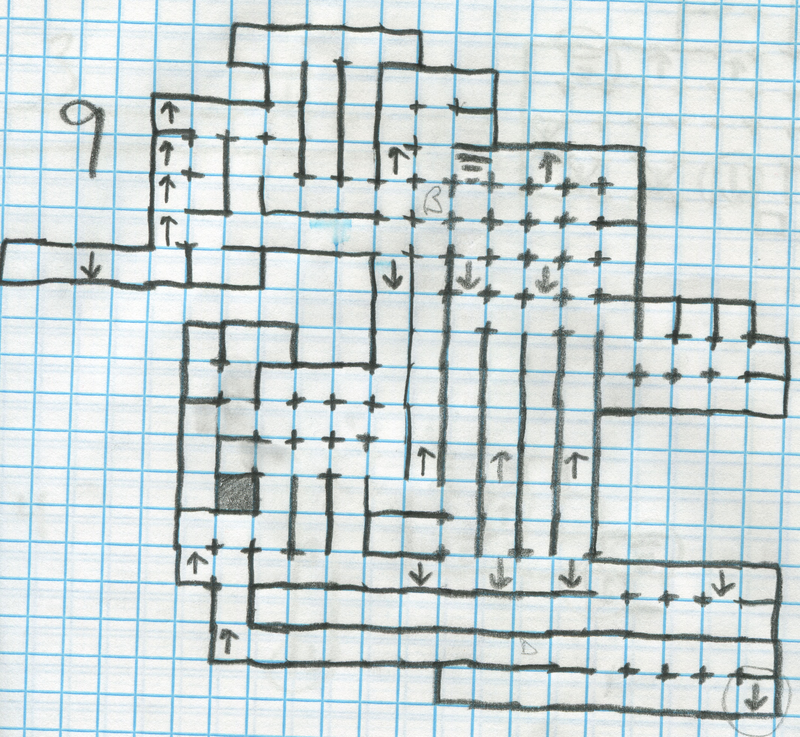 Here is a sample mapped dungeon level. Orbs can be obtained from fighting demons on level 9 or below so I usually only map each level until I find stairs that will go to the next level below. I’ve mapped out this dungeon level 9, fought and killed an Orcus, Demogorgon, and Bailor while traveling further downwards in levels making it all the way to level 17. 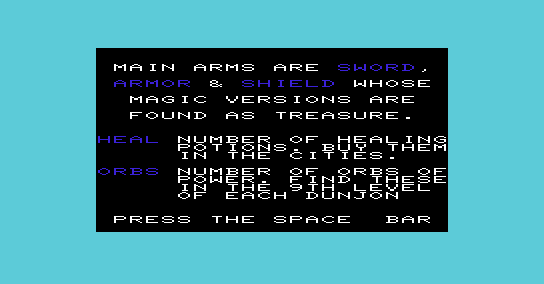 Dungeon levels are infinite, however the lower you descend you will gain more and more magical weapons and gold. All $20358580 of it. WOOHOO! Ca-CHING! I still wasn’t able to find another ORB yet, but by the time I made it back to the castle I had acquired a significant amount of loot to cash in. And cashed in all that lovely gold to gain 3 levels and pick myself up a healing potion, as I was now completely out of them. 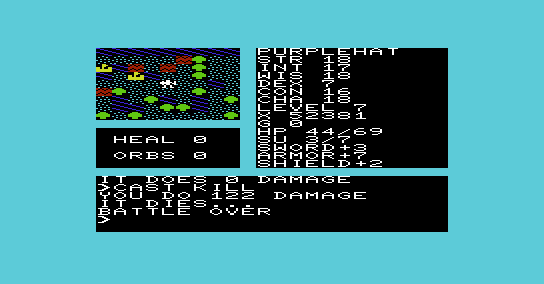 I’m now at level 17, with SU 17, SWORD+19, ARMOR+22, SHIELD+23 and XP 60754472 with 1 HEAL POTION, and 2 ORBS. 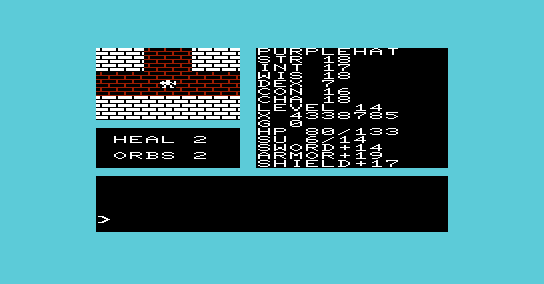 This entry was posted in Realms of Quest II and tagged Commodore, crpg, dungeoncrawler, fantasy, map, mapping, realms of quest, Realms of Quest II, retro, rpg, rubygolem, VIC-20 on August 7, 2016 by rubygolem. Seems like each demon battle in the search for the ten orbs gets more tough with each orb obtained. The first orb that I obtained was taken from an Orcus. I found a second orb when I defeated a Demogorgon. Now I’ve stumbled upon a demon that I hadn’t encountered before…a Balor. I killed the Balor, however no orb was recovered yet, so I’ll have to keep searching. In the meantime, it is cool to see some new monsters. 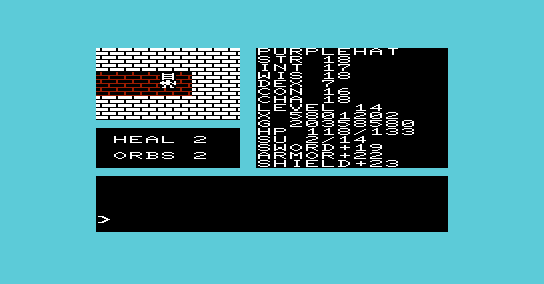 This entry was posted in BALOR, Realms of Quest II and tagged Commodore, crpg, dungeoncrawler, fantasy, Purplehat, realms of quest, Realms of Quest II, retro, rpg, rubygolem, VIC-20 on August 3, 2016 by rubygolem. While wandering through level #9 of a dunjon, in search of another Orcus, I stumbled upon a Demogorgon, and knew right away, that this was it. It’s a demon, and it has an Orb. The orb is now mine. 2 Orbs recovered, and 8 left to go. 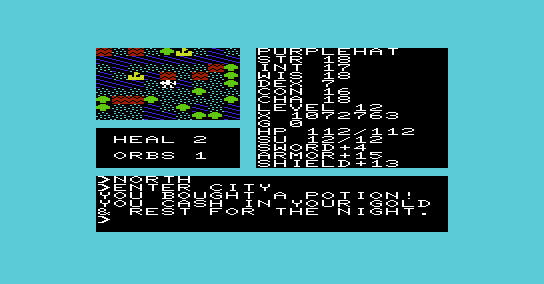 The dunjon to the right of the castle is where I found the second Orb. Now I’m off to find more dunjons. 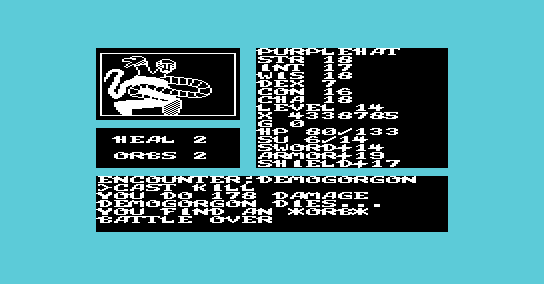 This entry was posted in DEMOGORGON, Realms of Quest II and tagged Commodore, crpg, dungeoncrawler, fantasy, Purplehat, realms of quest, Realms of Quest II, retro, rpg, rubygolem, VIC-20 on July 31, 2016 by rubygolem. 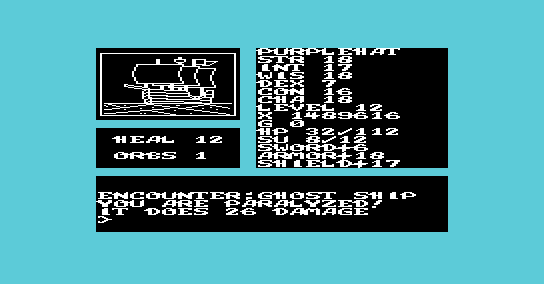 When traveling the overworld map, close to one of the numerous rivers, I came across a ghost ship! There are other encounters along the rivers, where you may run into mermen and the famed loch ness monster. 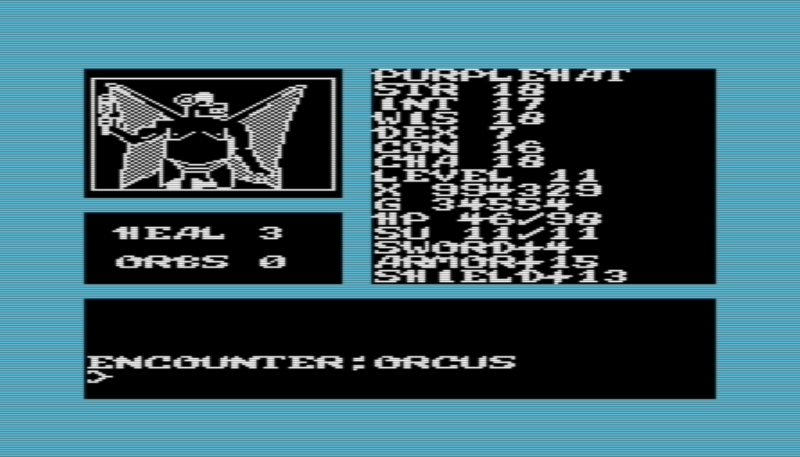 After some extensive battling in one of the dunjons, I encountered another Orcus, however I was defeated. 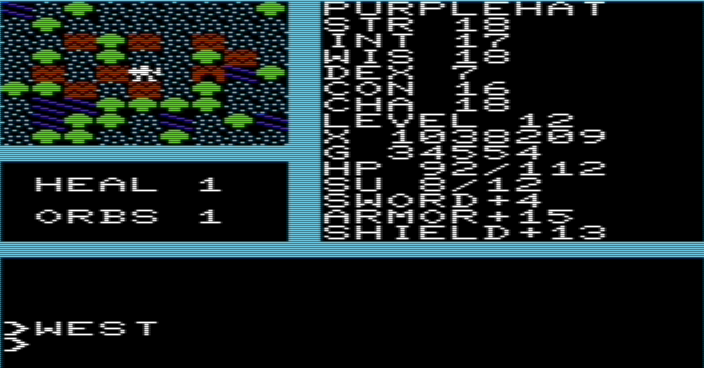 I stayed in the dunjons for as long as I could, reaching level 9 and even a few levels below and acquired a hoard of gold, and a whole lot more of +1 magical items. The lower you descend in the dunjons, the more gold and magic items you acquire. $2707547 Gold Pieces. More GP than I had Experience Points. Sword+14, Armor+19, Shield+17. I didn’t obtain a 2nd orb yet, but at least I knew I would be cashing in big time, this time around. Up 2 levels +1 potion. The extra 2 spell points and additional Hit Points will help out allot. 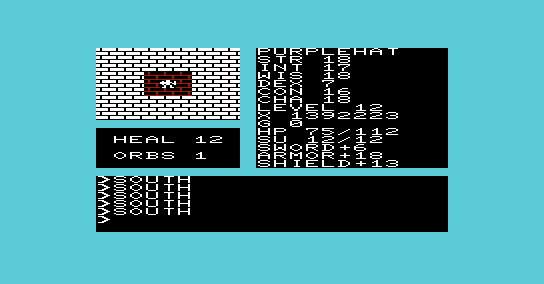 This entry was posted in Monsters, Realms of Quest II and tagged Commodore, crpg, dungeoncrawler, fantasy, Purplehat, realms of quest, Realms of Quest II, retro, rpg, rubygolem, VIC-20 on July 31, 2016 by rubygolem. While descending a dunjon, and on the 4th floor in search of the next set of stairs downwards to the 5th, I seem to have stepped into a trap. The walls caved in all around me, apparently. 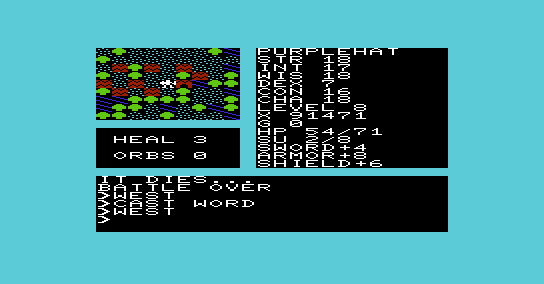 Luckily I had 6+ spell units, so I was able to cast a Word of Recall and zap myself back up to the surface by the entrance of the dunjon. 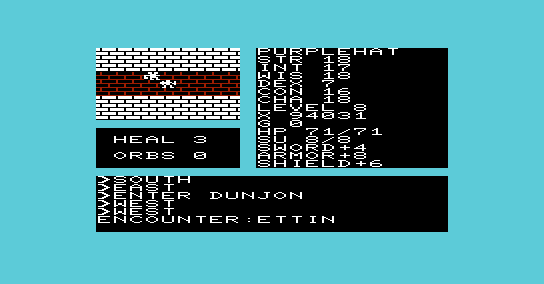 I suppose I could have alternatively cast level 5 spell “Gate” and teleport somewhere else in the dunjon, although I generally don’t use Gate as it teleports to a random location, and I prefer knowing where I am. Don’t know what I would have done had I not had at least 5 or 6 Spell Units. Reminds me of a wizard teleporting himself into a solid stone wall. Word of Recall is a lifesaver sometimes. I even found the King’s Castle. Another weird thing I found is a dungeon that seems to lead nowhere. 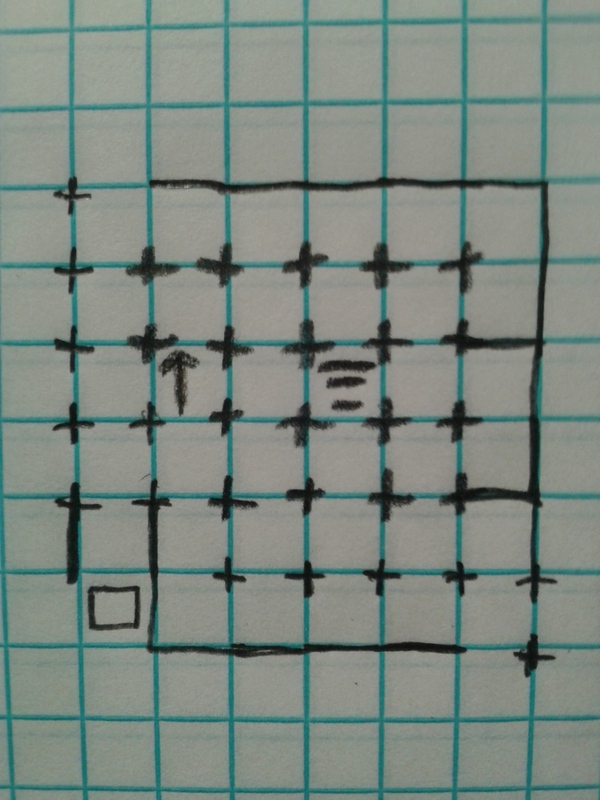 You can descend the dungeon, and while in the dungeon, you can step one square south, but other than that, it doesn’t lead anywhere, unless there is something that I’m missing. It’s pictures below. 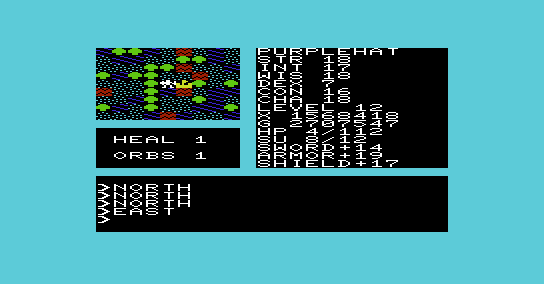 Though I’m pretty sure Realms of Quest II overland map and dunjons are all procedurally generated. I hope there are more than 10 dunjons in the overworld map, as it’d be a shame if the dungeon to nowhere prevented obtaining the final 10th orb. 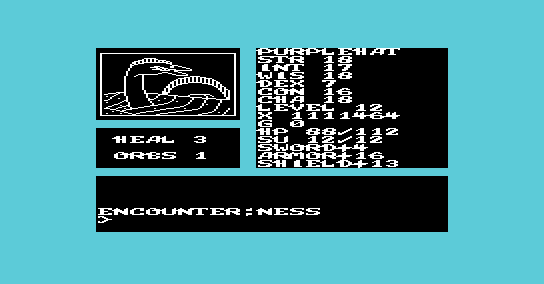 This entry was posted in Realms of Quest II and tagged Commodore, crpg, dungeoncrawler, fantasy, map, retro, rpg, rubygolem, VIC-20 on July 22, 2016 by rubygolem. 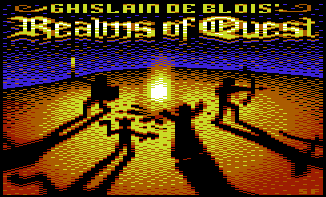 Here is an animation that I put together using GIMP, and all of the Realms of Quest IV, black and white images. This animation is set at a frame delay of 1500 milliseconds. 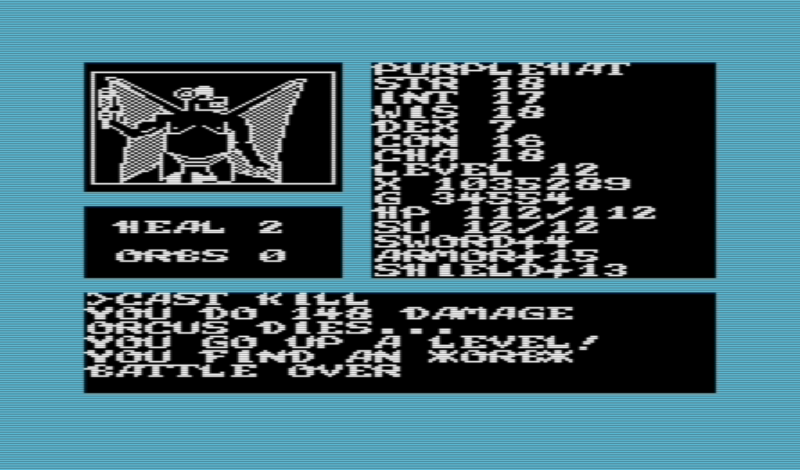 It features all of the monsters and locations and is based on classic dnd images. Here is one set at a frame delay of 2500 milliseconds for slower display. Here is an image I had previously created with the mapmaker program. In other Realms of Quest news, I finally found an Orcus on the 9th level of one of the dungeons in Realms of Quest II! Luckily I had all of my spellpoints and was able to dispatch the Orcus without too much damage to myself. Upon defeating the Orcus, I gained my first ORB! There are 10 ORB’s scattered throughout the Realms, so I now have 9 more ORB’s to find. 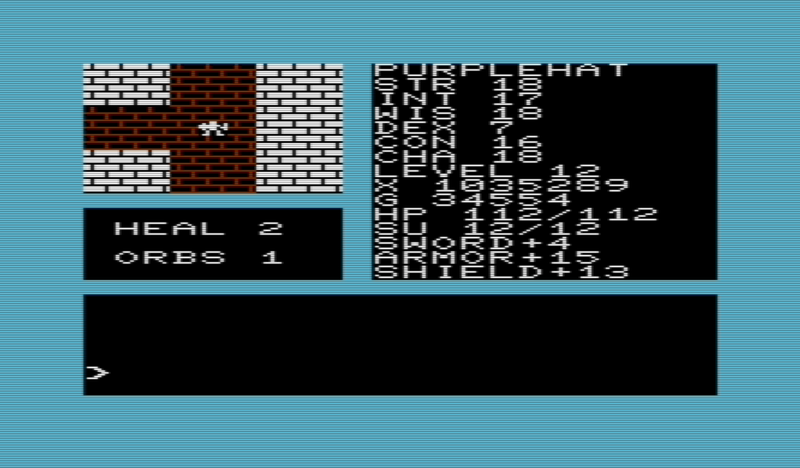 Defeating an Orcus also gave me enough XP to advance another level. (When you gain levels, all of your HP and SU’s get restored to their full amount, which will really help allot as now I will need to return to the surface by going up 9 levels, one by one. 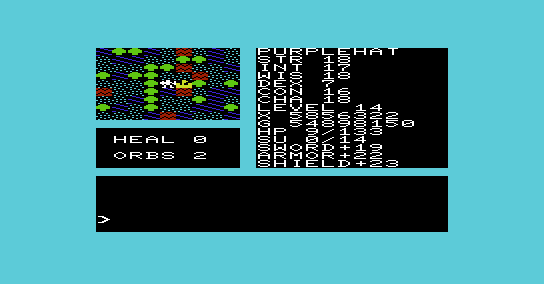 Alternatively, I could cast the #6 [Word of Recall], however, doing that would wipe out all of my accumulated gold. I hadn’t realized this until recently, and I wasn’t going to forfeit my $34554 gold pieces this time. This is the dungeon in which I descended. I took a screenshot of it so I can use as reference of having been there already, as all the dungeon entrances look similar and I need to locate 9 more of them to find the rest of the orbs. One peculiar thing with gold though, is that it doesn’t particularly matter how much gold you have accumulated when cashing your gold in for potions at the castle. You can have 100 GP or 34554 GP, but either way, when you cash in your gold for potions, you only gain 1 additional potion. But hey, potions are a necessity, so I’ll take any potions that I can get. 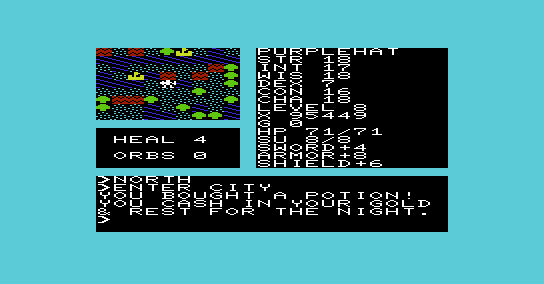 Actually, more accurately, your gold converts into XP when visiting the castle, and as a bonus you get one potion. 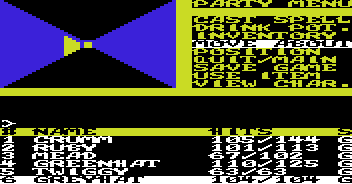 I’m back up to 2 potions now after reaching the castle and resting/trading in my hoard of gold for XP and 1 potion. This entry was posted in ORCUS, Realms of Quest II, RoQIII, RoQIV and tagged Commodore, crpg, map, mapping, realms of quest, Realms of Quest II, realms of quest III, realms of quest iv, retro, rpg, VIC-20 on July 16, 2016 by rubygolem. 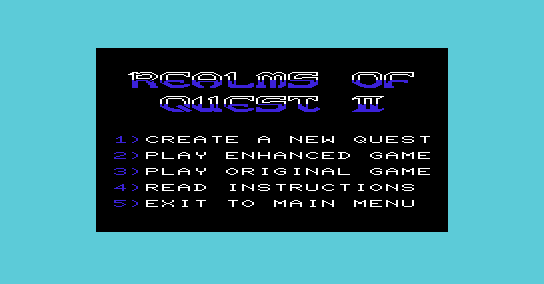 Side 2 of the Realms of Quest IV disk contains the special anniversary editions of Realms of Quest I and II. You can select between the original game and the enhanced game. 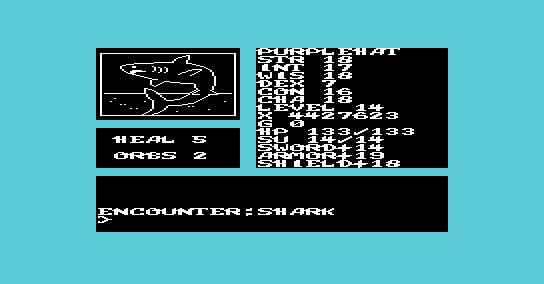 The original game is faster, but the enhanced version features in battle monster portraits which are nice. I’m picking up the game where I left off, so here is a recap of the plot. We need to find the 10 orbs of power. Each orb will be located on the 9th level of each dungeon, and will each be guarded by a Demon. Once we have defeated the 10 Demons and recovered all the orbs, we must seek out Nikaedor’s lair and defeat him. There are 6 spells that you can cast provided that you have enough spell points. The first spell requires 1 SP, the second spell requires 2 SP, and onwards etc. 6.) 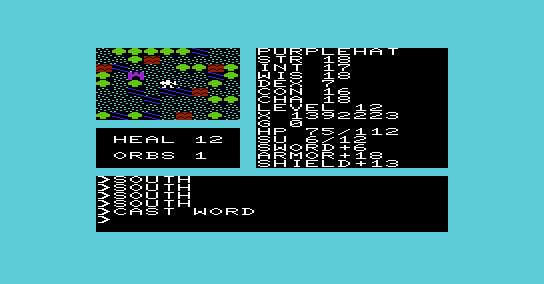 Word [of recall] (teleports party from wherever you are in the dungeon on whichever level, back to the overland map at the entrance to the dungeon). This is very useful. If you have enough gold and visit a castle to rest, you will be able to purchase healing potions which are vital to have with you when descending the dungeons. 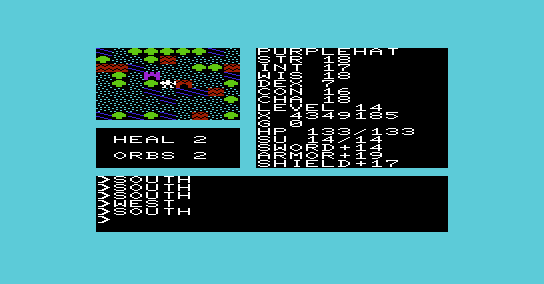 This entry was posted in Realms of Quest II and tagged adventure, crpg, fantasy, Purplehat, Realms of Quest II, retro, rpg, VIC-20 on April 7, 2016 by rubygolem.